Solarize Blacksburg had barely gotten underway last spring when the first complaints came in: homeowners who wanted to participate in the community bulk purchase of solar panels reported resistance from homeowner associations (HOAs) worried about aesthetics. Some HOAs were willing to work with residents, but others were not. Some HOAs refused to allow solar installations at all, even though most blanket prohibitions now violate state law. The problem repeated itself around the state as more solarize programs took off. Many HOAs hadn’t heard about the new law, passed during the 2014 session, that nullifies HOA rules banning solar panels, including bans that have been in place for decades. Under the law, the only prohibition still legal would be one written into the HOA’s “recorded declaration”—something pretty much unheard of in Virginia, according to Senator (and lawyer) Chap Petersen, who wrote the bill. But the law still allows “reasonable restrictions” on the “size, place and manner of placement” of solar panels, and what that means is open to interpretation. The Blacksburg organizers consulted lawyers and industry members to come up with a set of guidelines they hoped their local HOAs would use. But meanwhile, the same problem kept popping up across the state. Now the Maryland, DC and Virginia Solar Energy Industries Association—or MDV-SEIA, as the trade association is known—has weighed in with its own guide. Not surprisingly, it recommends that HOAs be as accommodating as possible to residents who want to install solar panels. It is, nonetheless, a good starting point for HOA officers coming to the question for the first time. In the absence of any other guidance, it also puts HOAs on notice that restrictions going beyond MDV-SEIA’s recommendations may be challenged. The industry guide contains a list of restrictions it considers reasonable, and those it does not. In general, restrictions that make a solar energy system either more expensive, or less effective, won’t pass muster. The classic example here is a requirement that solar panels not be visible from the street. If the street side of the house happens to be the only sunny side, then restricting solar panels to the rear is per se unreasonable. Restrictions the industry group thinks are reasonable include requiring homeowners to get approval from the HOA before installing the system, placing the panels more or less flat on the roof, and concealing the wiring and components as much as possible. Virginians dealing with this issue will take cold comfort in knowing that the fight over solar panels is playing out among HOAs and homeowners nationwide. Start typing “can HOAs” into Google, and the first phrase that pops up is “ban solar panels.” Moreover, while many states now prohibit solar bans, allowing “reasonable restrictions” is also common, and there is no consensus on what that means. The nonprofit Solar Foundation, working with the Department of Energy’s Sunshot Solar Outreach Partnership, prepared a guide for community associations that contains a comprehensive discussion of this issue. “A Beautiful Day in the Neighborhood” was published before Virginia’s law was revised last year, but it remains an excellent resource for homeowners who want to educate their neighbors about the value of solar—and with any luck, head off disputes about what kind of restrictions the law allows. This entry was posted in Solar and tagged HOAs, MDV-SEIA, solar, Solar Foundation. Bookmark the permalink. Persons interested in HOAs and solar panels may wish to review the history of similar groups banning/regulating satellite dishes. Congress banned most barriers to a homeowner’s installation and use of smaller satellite dishes, and the FCC enforces the law. By and large, only reasonable regulations, primarily directed at safe installation and protection of common areas, are permitted. Very helpful, Rob, thank you. Great summary Ivy. We here in Blacksburg are happy to share our experiences and the HOA guidance materials we developed with other folks across the state. Feel free to send them our way! Once again another excellent article! 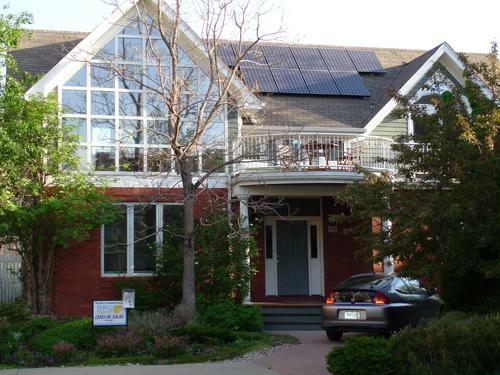 The attached picture of our home is indicative of our total support of solar (Panels & Hot water)! To bad residents are constrained to 10 KW, our 9 KW system is offsetting ~50% of our electric demand. This is interesting. My HOA, Heritage Hunt HOA in Gainesville, is trying to slip its ban on solar panels into the grandfather clause by retroactively inserting the into its published governing documents. Heretofore, the ban has been in its Architectural Guide Lines which addresses home improvements like door colors, fences, mail boxes, and holiday decorations. While published, these are changed every year and are not part of the HOA articles of incorporation, bylaws, or declarations. The HOA is currently trying to amned its bylaws by making its ban part of the bylaws. My reading of the law is that the ban needed to be in it articles of incorporation, bylaws, or declarations before the VA law was passed to be eligible for the grandfather clause. Can someone in Sen. Chapman’s office who worked on the legislation help me better understand the Senator’s intent? Just wanted to let you know the link to “A beautiful day in the neighborhood” in this article is a dead link. Thanks for bringing that to my attention. I’ve got the updated link in there now.